Moving on is a natural process. People get new jobs all the time, but when that person is a Saturday Night Live cast member it hurt more than normal. 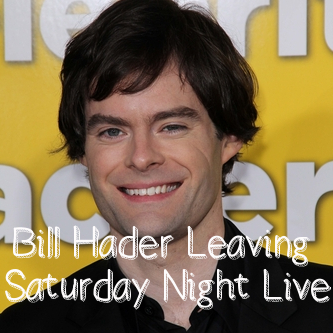 Bill Hader, the comedic genius behind Stefon, is leaving SNL after the season finale this weekend. “It was a hard decision, but it has to happen at some point. It got to a point where I said, ‘Maybe it’s just time to go.’” he told The New York Times. Hader joins Seth Meyers, who has been tapped to host Late Night, in walking out from the show. Jason Sudekis could also be departing after this season. According to Hypable, Sudekis stayed on an extra season to play the role of Mitt Romney in the presidential election season. As we prepare to one of SNL’s three leading men, let’s take a look back at the good times of Bill Hader. If you want to see Bill Hader, I’ve got just the place for you. New York’s hottest club correspondent can be found cracking it up in this Youtube collection of his best moments. I dare you to get past the first minute without laughing. I dare you. Of course, the Justin Timberlake episode of SNL was one of the best. Stefon had a quality Weekend Update segment in honor of Spring Break. This was the greatest Stefon skit of them all. He introduced us to the hoomba – a human roomba – and had a pretty spectacular make out with Seth Meyers. We will certainly miss Stefon, the character with the most scene breaks in SNL history. Hader read the entire character cold, so he never knew what the writers planned to throw at him. Thank you for the laughs, Bill Hader.